Thank you for picking up this CD and exploring what it has to offer. 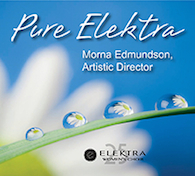 As I write, it’s the spring of 2012 and Elektra Women’s Choir is half-way through its 25th anniversary season. A recording like this has two intended audiences: one of listeners who are attracted to the exhilarating and moving sounds of fine choral music, and another of choral conductors who are looking to discover new repertoire for their own ensembles. I hope you all find something of beauty and value on these tracks They represent highlights from several seasons of Elektra programming, and pieces that I feel are worthy of being heard and appreciated far and wide. All but three of the composers and arrangers are alive and well today, most of them Canadians, and their presence on this recording signifies my true respect for the beautiful work they do creating unique and engaging works for women’s voices. Composer – performer – listener – the circle is incomplete without all of us. Again, thank you for reaching out to discover this music. I hope you will find a joyful and meaningful listening experience ahead of you. Close your eyes, open your ears, and take a deep breath of pure Elektra.